When I loved Julian, I turned my eyes away from the fact that he wasn’t emotionally available to me, or even to himself on most days. Did you know that frogs can’t swallow with their eyes open? It’s true. What have you been swallowing in love and in relationships simply because your eyes were closed to the truth? 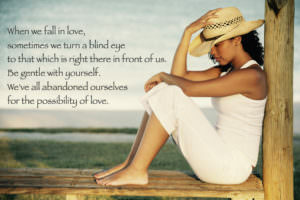 When we fall in love, it causes us to sometimes turn a blind eye to that which is right there in front of us. We overlook actions, but listen deeply to words. We shut our eyes to how we’re allowing ourselves to be treated, thinking that if we love enough things will surely change. Sometimes we ignore the facts for the possibility of a dream. We choose to keep our hearts contained in captivity, because we’re too afraid of the freedom that’s right there waiting for us. The unknown is too scary, so we hang on long past the expiration date. Be gentle. We’ve all abandoned ourselves for the possibility of love before. There’s no judgment here. Instead, learn to love with your eyes wide open. Make the choice to live and love from a place of freedom, clarity and truth. Be willing to look within for all the answers you need to create the kind of love you desire for yourself. When I married my first husband for safety, I didn’t realize that not only did I keep myself from having the love I desired, but I also kept him from finding someone who could love him the way he deserved to be loved. When I was able to forgive Michael and Julian for not being able to love me the way I needed to be loved, I released some resentments that were keeping me stuck in my victim story and that release provided the opportunity for a real breakthrough of creating a different experience for myself in love. It was only then, after my eyes were wide open (as well as my heart) that I could attract, receive and sustain the beautiful, supportive, soulful, lasting love I have with my amazing husband, Derrick.